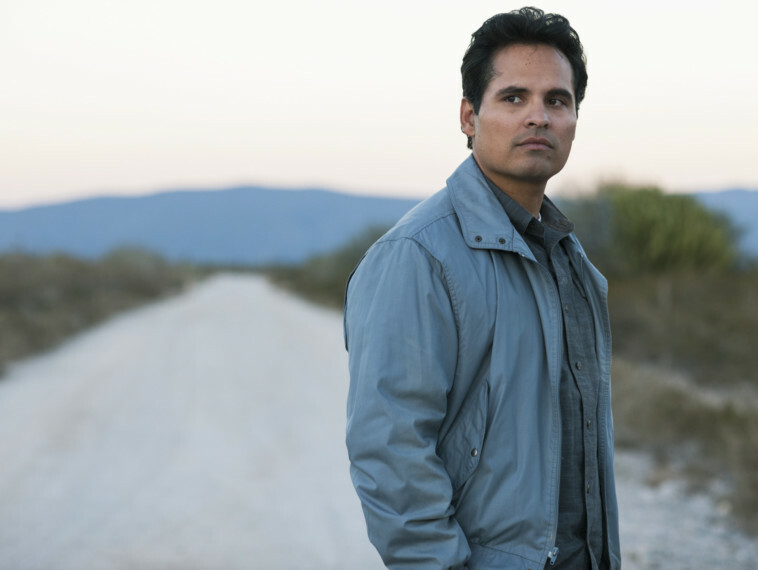 Even before signing up for ‘Narcos: Mexico,’ Michael Pena knew there would be no happily-ever-after for his character, Kiki Camarena, a real-life agent for the Drug Enforcement Administration. “If you look at the Wikipedia page, you know that he was tortured and killed, and he sacrificed himself, basically,” Pena said of Camarena’s murder, which made headlines in 1985. But that grisly ending didn’t dampen his desire to take on the role, or diminish the suspense in season four of the ‘Narcos’ franchise, now on Netflix. The first three seasons of ‘Narcos’ chronicled the ascent of the Colombian cocaine empires from the 1970s through the mid-90s, starting with the reign of Pablo Escobar. ‘Narcos: Mexico’ travels back to the mid-1980s and the rise of the Guadalajara cartel. Camarena requests a transfer from Fresno, California, into this realm, where he plans to cut a crop of would-be kingpins off at the knees. It’s also an exercise in futility, with the line between good and bad blurred and bloody as governments on either side of the border publicly support drug eradication, while privately turning a blind eye to thousand-acre marijuana fields and rampant warfare. On December 14, Pena can be seen playing yet another DEA agent — this one trailing an elderly courier for a cartel — in ‘The Mule,’ directed by and starring Clint Eastwood, who first cast Pena as the boxer Omar in ‘Million Dollar Baby,’ which won multiple Oscars, including for best picture, in 2005. Pena has also spent time this autumn shooting the live-action ‘Dora the Explorer’ movie in Australia, opposite Isabela Moner and Eva Longoria. What was your initial reaction to the role of Kiki? I thought, I don’t know if I want to play another cop, especially for eight months, because I did it in (David Ayer’s ‘End of Watch’ with Jake Gyllenhaal). But this was a fantastic role. I thought, wow, this guy, he’s full of a lot of tough love, and he’s just completely different. Also, the world was different. It was a time when the DEA was fairly young in this country as well as in Mexico, so it wasn’t as organised as it is now. Kiki is the kind of guy that just wants to stop the bad guys because he doesn’t like injustice in the world, and those guys should pay and go to jail. And he knows in his heart of hearts that if you’re a billionaire and you spend half a million dollars on a school (like Pablo Escobar), you’re buying those people. I hate to admit that I sometimes found myself rooting for the cartels. You do root for them in a way, because — and this is by no means a justification of what they do and who they are — they all come from very poor countries. And even if you win and you’re doing great in life, the best you can do is, like, 10th place. That’s like, cleaning toilets somewhere. The educational system isn’t very good. Companies from other countries come in and exploit that, and they keep (their workers living) paycheck to paycheck almost by design. And so it’s very complicated, but in their mind it’s easily justifiable as to why they execute their plan to become drug lords. And now you’re playing yet another DEA agent in ‘The Mule,’ your second film with Clint Eastwood. Same job, completely different characters. This one is a wisecracking guy. It’s almost, like, just me. Eastwood is the kind of director you’re just like, ‘What do you want me to do? I’ll do whatever.’ When you’re in a TV show, you have to pretty much do whatever is on the page, because there’s so many moving pieces. But with him, you really get to explore. Eastwood is one of those guys that cast me early on. Back in the day, I auditioned for ‘Million Dollar Baby,’ and in his breakdowns there was none of that (racial categorisation). There was just like, ‘Here’s the character.’ He’s always going by his own rules. There’s no labelling when it comes to a Clint Eastwood movie. By ‘breakdown,’ you mean … ? Fifteen years ago, it was really, really tough because there were these breakdowns for (casting) where it would specifically say, ‘Lead part: Caucasian; second part: Caucasian; Caucasian, Caucasian, Caucasian.’ And it wouldn’t be until the 10th part that it would be open to African-Americans. And then it would be up to ‘15: open to all ethnicities.’ So the best that I could do back in the day was 15th place. I was offered gangster parts all the time. Nowadays, that doesn’t exist. Let’s talk about ‘Ant-Man.’ In October, director Peyton Reed said there were no plans for a stand-alone movie for Luis. Is that disappointing? No. It started off as a small part, and then it ended up being something really cool. And there was never, ever any talk of that anyway. It’s all good. Will there be a third instalment? I have no idea. They’re figuring it out. And even if I knew, I’d still have to give you the same answer. ‘Narcos: Mexico’ is streaming now on Netflix.